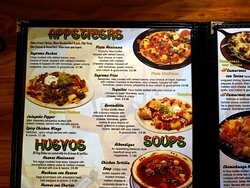 Choice of meat: chicken, shredded beef & pork, chile verde, chile colorado & ground beef. Whole beans upon request. Chips coated w/ refried beans, your choice of meat, layered w/ melted cheddar cheese & topped off w/ tomatoes, green onions, jalapeños, sour cream & guacamole. Seasoned fries coated w/ refried beans, your choice of meat, layered w/ melted cheddar & monterey jack cheese, topped off w/ tomatoes, green onions jalapeños, sour cream & guacamole. A flour tortilla filled w/ a savory mixture w/ cheddar & monterey jack cheese, tomatoes, green onions & your choice of meat, grilled to a crispy golden brown, sour cream & guacamole. 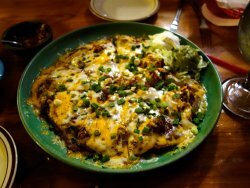 Crunchy flour tortilla topped w/ refried beans, your choice of meat, layered w/ melted cheddar cheese, topped off w/ tomatoes, green onions sour cream & guacamole. Mild, breaded jalapeños stuffed w/ cream cheese, served w/ red jelly sauce. Flour tortilla stuffed w/ your choice of chicken or beef, monterey jack cheese, rolled & crispy fried. 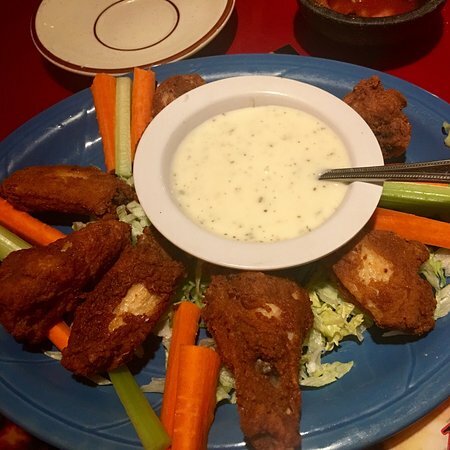 Delicious, spicy wings served w/ celery & carrots. Crispy corn tortilla topped w/ broiled chicken melted cheese & avacodo slices in a delicious chicken broth. 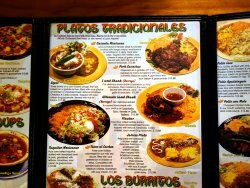 All egg dishes are served w/ rice, beans & tortillas. Two eggs cooked over easy, topped w/ scrumptios relleno salsa & melted cheese, served w/ rice & beans. Eggs scrambled w/ shredded beef, bell peppers & onions. A blend of scrambled eggs & juicy mexican chorizo cooked w/ green onions & tomatoes. Eggs scarmbled w/ shredded beef, bell peppers & onions, wrapped in a flour tortilla. Grilled chicken breast layered over rice w/ melted jack cheese, our delicious mexican sauce cooked w/ bell peppers, onions, carrots, & mushrooms. Sliced‎ chicken breast cooked w/ mushrooms in our tasty creamy sauce. Finished off w/ sprinled mexican cheese. Chicken breasts cut into strips sauteed w/ onions, bell peppers, & tomatoes. A‎ grilled chicken breast marinated w/ our special & delicios red mild sauce, over a bed of green peppers & onions mixed w/ a-1 sour suace. Topped off w/ sour cream. Flour tortilla stuffed w/ chicken, monterey jack cheese & cream cheese rolled & fried crisp, served w/ sour cream & guacamole. Chopped chicken breast cooked in our mouthwatering traditional dark mole salsa. Strips of chicken breast sauteed w/ our authentic mexican sauce, green & white onions. Strips of chicken breast sauteed in our athentic mexican sauce layered over rice, w/ mushrooms & sliced white onions. Whole cholesterol-free beans served at your request. Taco, Enchilada, Tostada or Tamale. 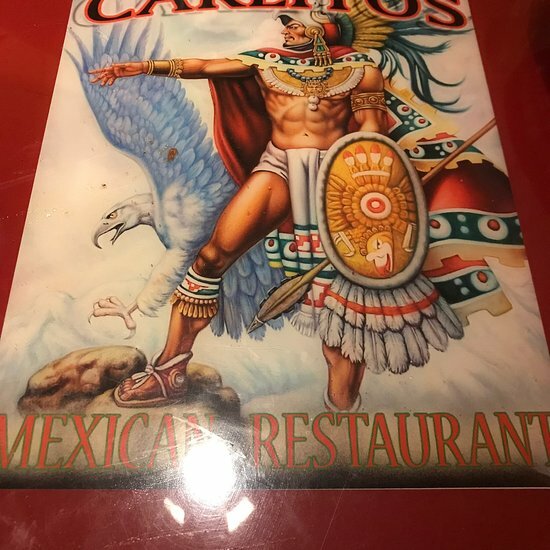 Chile Relleno, Burrito, Chalupa or Chimichanga. Chile Relleno, Burrito, Chalupa or Chimichanga, Enchilada or Tamale. Shrimps carrots cooked in our special red suace. Served sizziling over sauteed bell peppers & onions. A combination of juicy chicken, steak & shrimp. 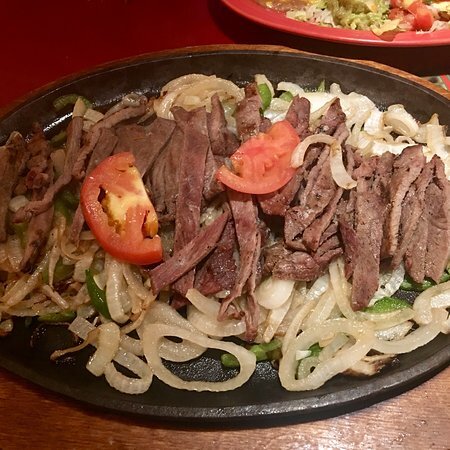 Served sizzling over sauteed bell peppers & onions. Three corn tortillas dipped in our mild red suace, stuffed w/ pork, that is marinated in herbs & spices, topped w/ pico de gallo & served w/ guacamole. Luscious blend of tender steak & chicken cooked w/ tangy onions, mushrooms & tomatoes in a zesty, thick stew salsa. Topped w/ melted jack cheese & strips of green onions. Served w/ pico de gallo & slices of avacado. Prepared on a griddle w/ bell peppers & onions topped off w/ our authentic mexican salsa & garnished w/ sour cream & guacamole. Four corn rolled taquitos stuffed w/ shredded beef & pork, garnished w/ lettuce, tomatoes, sour cream & guacamole. Our delicious lamb shank is spiced in a mild red sauce, then roasted in the oven, served w/ lettuce, pico de gallo & avacado. Three corn tortilla submerged in our mild red sauce, filed w/ your preference of chicken or steak. Completed w/ sprinkled juicy tomatoes & mexican cheese. Garnished w/ sour cream. Three bowls of a corn-based dough that are baked on a griddle & then filled w/ your choice of chicken or shredded beef, lettuce, tomatoes, cotija cheese. Topped w/ sour cream & guacamole. Four flour rolled tortillas stuffed w/ mixed shredded beef & pork, topped w/ lettuce, tomatoes, cotija cheese, sour cream & guacamole. 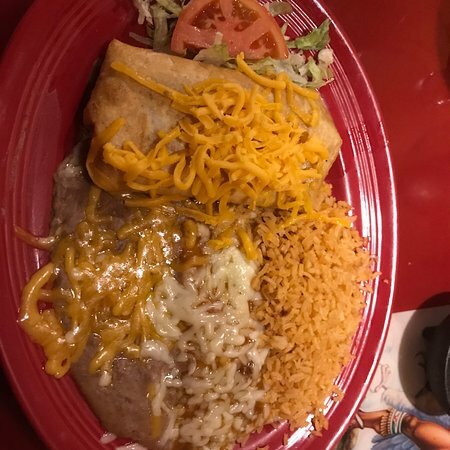 Prepared w/ breaded chicken breast, our delicious pollo loco smothered w/ cream cheese, then topped off w/ american cheese & a yummy jalisco style cheese enchilada, served w/ rice & beans. Garnished w/ pico de gallo salsa. 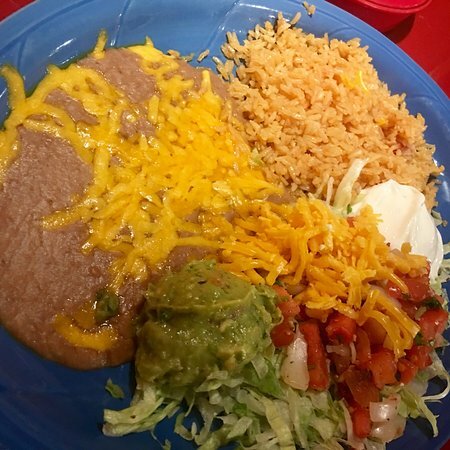 Flour tortilla stuffed w/ choice of meat, chicken, ground beef, mixed shredded beef & pork, chile verde, or chile colorado, rice, beans topped w/ melted cheese covered w/ burrito salsa & finished off w/ tomatoes, lettuce & cotija cheese. Flour tortilla filled w/ sauteed seafood. Including shrimp, fish, scallops & crap mixed w/ copped onions, bell peppers, mushrooms, carrots. Then damped w/ our delicious seafood salsa. Flour tortilla stuffed w/ a delicious homemade chile relleno, rice, beans, covered w/ burrito salsa, melted cheese & finished off w/ lettuce, tomatoes, & cotija cheese. 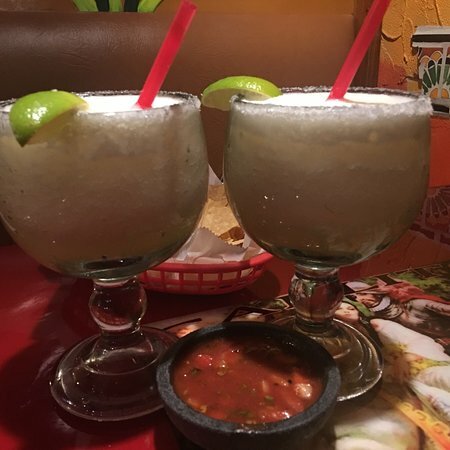 Your preference of chicken or steak damped w/ chile relleno salsa & a orange creamy sauce w/ sprinkled pico de gallo, served w/ sour cream & guacamole. Flour tortilla stuffed w/ a mixer of healthy veggies; broccoli, muchrooms, carrots, corn, zucchini, rice & colesterol free beans. Damped w/ vegetable salsa & finished off w/ fresh lettuce, homemade pico de gallo, & cotija cheese. 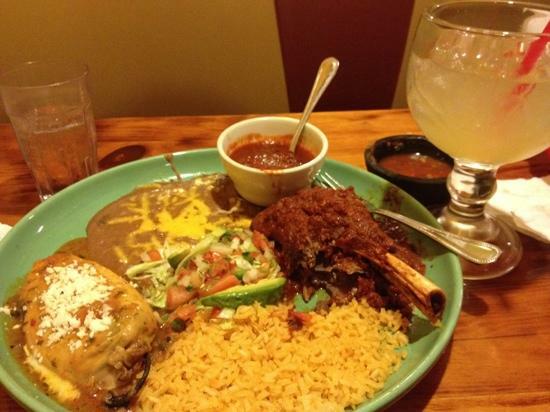 Flour tortilla stuffed w/ juicy skirt steak, rice & beans, topped w/ our delicious salsa. Garnished w/ bell peppers, onions jalapeno, & sour cream. Flour tortilla filled w/ rice, beans, chicken or steak, bell pepper, onions, covered w/ a mouthwatering salsa. Served w/ pico de gallo, sour cream & gaucamole. Two corn tortillas stuffed steamed veggie & covered in our delicious rich creamy sauce. Two homemade corn husks stuffed w/ deliciosly prepared spinach. Covered w/ a creamy sauce. Flour tortilla stuffed w/ a mixer of healthy veggie: broccoli, mushrooms, carrots, corn, zuccini, rice & cholesterol-free beans. Damped w/ vegetable salsa & finished off w/ fresh lettuce, homemade pico de gallo & cotija cheese. Two corn tortillas stuffed w/ tasty prepared spinach. Covered w/ our special mild green sauce. Steamed veggie over a bed of sauteed bell peppers & onions, served sizzling. Seasoned‎ bacon wrapped w/ shrimp, layered over bell peppers, onions, then covered w/ melted jack cheese. Served w/ pico de gallo, sour cream & guacamole. Shrimp‎ sauteed w/ our authentic mexican sauce, white onions, tomatoes & carrots for a great taste. A delicious blend of shrimp, mushrooms, onions, & crushed red peppers in our spicy ketchup based sauce served w/ lettuce & tomatoes. Scrumptious shrimp cooked w/ mushrooms in our tasty creamy sauce. Finished off w/ a spread of cotija cheese. Garnished w/ lettuce & tomatoes. A mixture of shrimp, octopus & scallops in a tangy ketchup-based cocktail suace. With tomatoes cilantro & slices of avocado. Shrimp sauteed w/ mushrooms, onions in butter, garlic, & crushed pepper. Garnished w/ lettuce & tomatoes. A flour tortilla stuffed w/ a delightful mixture of whitefish, scallops & shrimp, cooked w/ bell peppers, carrots, celkery & mushrooms. Deep fried & topped w/ a seafood salsa. Served w/ sour cream & guacamole. Shrimp or scallops sauteed in our authentic tomato sauce, cooked w/ muchrooms, & onions for a great taste. Layered over rice w/ melted cheese. Garnished w/ lettuce & tomatoes. Boiled shrimp in a tangy ketchup-based sauce. With tomatoes, cilantro & avocado slices. 工作人员很友好（和当地人在一起）。 但不是那么多的游客。 这里的服务很周到也是当地人。 但不是那么多的游客。 食物。 令人失望的,湿湿的,不完整的。 没有那么多! 他是我最喜欢的餐厅。 太让我失望了。 我们在那里的前一个小时我们终于得到了我们的食物。 我和我的husans有冷的食物。 我的3岁的孩子被她的手指flash播放器实在是太热了,我和我的11岁的孩子说没有豆子和墨西哥披萨有豆子到处都是她的。 我们已经花了一个小时等我们的食物。 我不打算再等30分钟才能到食物在微波炉里面加热和重新整理我的女儿的食物。 那个经理提出请我们吃一餐花太多但错了我们就离开房间去麦当劳。 我们的食物中的接收到的很及时,并按正确的顺序和热!